In my last post, I argued that enforced separation of investment banking and commercial banking would not eliminate the need to provide central bank support to investment banks and other non-banks in the event of another Lehman-type collapse. There followed an extensive discussion in the comments, in the course of which it became apparent that many people simply don't understand how bank runs work. So I thought I'd explain. 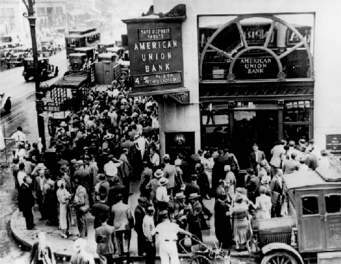 Queues of retail customers outside a bank, waiting to withdraw their money. But actually this sort of bank run is very rare. The run on the UK's Northern Rock in 2007 was the only retail run in the financial crisis and the first in the UK for 140 years. What is more frequent - and far more damaging - is a wholesale run. The Northern Rock retail run was preceded by a wholesale run that forced the Rock to go to the Bank of England for emergency liquidity assistance (ELA). And the wholesale run continued for the next five months despite ELA and government guarantees, only ending when Northern Rock was nationalised. Wholesale runs occur when investors pull their funds all at once. "Investors" in this case means institutional investors and high net worth individuals. There were two major wholesale runs in the financial crisis, one in 2007 after BNP Paribas forced the closure of the Bear Sterns hedge funds by announcing that it could not value mortgage-backed securities used as collateral, and the other - much larger and potentially devastating - a run on tri-party and bilateral repo when Reserve Primary money market fund "broke the buck" after the fall of Lehman. It was this second run that very nearly brought down the entire financial system and forced central banks around the world to provide liquidity support not only to commercial banks but to investment banks and other "shadow" institutions. Phase 3: refusal to roll over short-term (overnight) wholesale borrowings. These three phases may be concurrent or sequential. But they have different effects. Electronic transfers of funds can happen at any time and require funds to settle. If the institution being run upon is a commercial bank, the lender of last resort is responsible for ensuring that funds to settle are available. But if the institutions being run upon are investment banks or other non-banks, the commercial banks through which they settle transactions will need central bank liquidity support. Investment and shadow banks have no direct access to payments systems, so are forced to settle payments through commercial banks - and because of this they have deposit (transaction) accounts with commercial banks. So in a run on investment banking, the volume and value of payment transactions through commercial banks vastly increases, often in a rather unbalanced way, and there may be a high incidence of fails as the demand for funds exceeds the credit available in the transaction accounts. In effect, a run on investment and shadow banks causes a run on the commercial banks that support them. Clearly, the lender of last resort can prevent this run becoming a crisis - but there are limits to central bank support, which can be breached in a major bank run, as I shall explain shortly. Increasing haircuts on collateral cause increased demand for cash. The haircut is the amount by which the value of the collateral exceeds the amount lent in, say, a repo. If the value of the collateral remains the same (this is a VERY big "if" in a bank run, as I shall explain shortly), then an increase in the haircut means that the amount lent is reduced. If the loan already exists, or (more likely) is rolled over, that means that the borrowing institution has to find additional cash to plug the gap left by the reduction in the loan amount. If lenders refuse to roll over existing lending, or raise the interest rates on short-term borrowing to unaffordable levels, institutions that are dependent on short-term wholesale borrowings suddenly find that they cannot fund their commitments. If they are denied central bank liquidity support, they are forced to sell assets to raise cash. If they cannot do this then they fail in a disorderly manner. This is the most damaging phase of a wholesale bank run. This is what brought down Northern Rock in 2007. This is what brought down Lehman in 2008, followed by many other banks. This is what very nearly killed the entire financial system. Financial institutions being "run upon" develop large holes in the liability side of their balance sheets and experience severe funding distress. However, if reliable sources of cash can be found - such as an effective lender of last resort facility - then the bank run can (in theory) be allowed to run its course: if plentiful liquidity is made available then investors may be reassured that their funds are not about to evaporate and the bank run may fizzle out. Some people think that because a bank run always takes place via commercial banks even if the institutions actually run upon are shadow banks, it is only commercial banks that need liquidity support: shadow banks can be allowed to fail without commercial banks and their retail customers being adversely affected. That would be true if a bank run only involved deposit account withdrawals - phase 1. But when phases 2 and, especially, 3 occur, that separation doesn't work. A run on shadow banks threatens the solvency of commercial banks. And that is because of the effect of a bank run on the ASSET side of the balance sheet. Institutions being run upon have to find cash. Lots of it, and fast. If they cannot borrow, then they have to raise money by selling assets. Distressed asset sales by a number of institutions at the same time force down the market price of those assets. So a widespread run on shadow banks that cannot obtain liquidity support from central banks causes asset values to collapse. All asset classes are affected, including "safe" assets used by commercial banks as collateral for central bank funding. This is why the Fed provided liquidity support to shadow banks. It was supporting asset prices. And it continued to do so with QE and other unconventional interventions. Collapsing asset values are disastrous not only for the financial sector but for the economy as a whole. If there was one thing that Lehman and its aftermath demonstrated, it was that the idea that investment banks can be "allowed to fail" if the result will be asset value collapse is sheer fantasy. Central banks have no choice but to support any financial institution caught up in a major wholesale bank run, whatever its status. This is not to say that an insolvent investment bank should be bailed out by taxpayers. How we deal with imprudent financial firms that have got into difficulty is an entirely different matter from how we deal with a financial panic. I would be the last person on earth to suggest that governments should recapitalise or otherwise rescue failing investment banks. Indeed I am not keen on governments bailing out any sort of bank: government backstop without control encourages bad management and poor asset quality, which are the two biggest causes of bank failure. But denial of liquidity support to some institutions in a widespread bank run would be disastrous. To my mind the Fed got it right in the crisis. It threw money at everything, regardless of its status, and by so doing, prevented a catastrophe. But the direction of discussion since, particularly in Europe, has been counterproductive. Cherry-picking which institutions qualify for central bank support is never going to make the financial system more robust. So my recipe would be: provide central bank support to everything and taxpayer support to nothing. And take steps to ensure that investment banks and commercial banks alike maintain good asset quality and defensive balance sheet structures. Please excuse a possibly stupid question, but why is a collapse in asset values the worst imaginable outcome? Especially if poor asset quality, or a speculative bubble in asset prices, has been a cause of the problem. Does it lead inexorably to another Great Depression? Would assets not return, post crash, to a proper level? Collapsing asset values bankrupt otherwise healthy institutions. In a retail context the equivalent is collapse of the housing market: a sudden house price crash bankrupts householders, mortgage lenders and ancillary services. Managed decline of overvalued assets is sensible, disorderly collapse is not. 1. Why is an upward movement of price of an asset not dangerous? 2. Why do you think there could be people who might scoop up the asset at the cheap (with the money they had prudently saved). Thus the asset goes to the prudent saver as it should and not to borrowers and speculators. 3. Do you think that as the asset gets scooped up its prices will rise and eventually find its equilibrium? Why is that bad compared to the Fed bailing out speculators and setting the floor. Let the market set the floor. Why allow a regulator or government entity set the price? 2. Don't you think there could be people who might scoop up the asset at the cheap (with the money they had prudently saved). Thus the asset goes to the prudent saver as it should and not to borrowers and speculators. Don't you think what you are saying will just make investments banks more comfortable with taking risks which can bring the system down as they are sure of being bailed out. In fact this is the very basis on which they are standing today. Of course unsustainable asset price rises are dangerous. But you don't get sudden catastrophic rises in asset prices in the way that a liquidity crisis causes sudden catastrophic falls. This post is specifically about BANK RUNS - not about booms and busts in general. In a widespread bank run (a "panic"), markets do not operate normally - in fact they don't really operate at all. There is no way that market pricing in any way reflects the real value of assets. When the whole world is selling there is no floor under asset prices, so if a bank run on the scale of the post-Lehman run is allowed to continue it eventually bankrupts everything. The priority must be to stop the run. That's why central bank intervention is necessary. Your notion that buying by "prudent savers" can put a floor under asset prices is simply wrong. No prudent saver buys into a rapidly falling market - that is by any reasonable definition a high-risk strategy. Liquidity support is not "bailing out". I was very clear in the post that I do not agree with government rescue of insolvent banks - of any kind. I do not think we have been rigorous enough in dealing with damaged banks. I may write another post on clearing up the mess left by a massive bank run. "Of course unsustainable asset price rises are dangerous. But you don't get sudden catastrophic rises in asset prices in the way that a liquidity crisis causes sudden catastrophic falls." The problem is unsustainable asset prices is something the Fed likes and does not want to do anything about it. In fact encourages it. Makes people who own asset feel good as it is rising. Catastrophic fall is the only way a bubble will revert to the mean. What I meant by "prudent savers" putting a floor is not that they will when it is rapidly falling down but that they will start coming out after the assets have really been beaten down after the dust has settled. Also it need not be prudent savers it might well be prudent companies who have not loaded up on debt and are cash rich and who are solvent and who probably anticipated this and were waiting to take advantage of it. By allowing the Fed to put a floor you are not allowing the market to set the price and allow the Fed to distort the prices. This is not capitalism. "I was very clear in the post that I do not agree with government rescue of insolvent banks". By providing liquidity to the insolvent banks the Fed ends up doing just that. Calling it by any other name does not change the action. In what way can we justify support to Banks which become insolvent because they have been imprudent in their lending. If you bail them out once they know pretty well you will bail them out again. While generally I agree with your thesis that run on the banks can create havoc, the solution cannot be bailing out (or in your words providing Central Bank support) it has to be good regulation (which includes not creating a bubble in the first place with low interest rates), conservative norms in lending and filing bankruptcy by insolvent banks. THis is same argument that Hank Paulson used (Save the Banks or Civilization will be destroyed;-). May be we need the destruction of this system to create a better one. You are still confusing general boom and bust with a market panic, which is what a widespread bank run is. The two are not the same and require different medicine. Institutions that become insolvent because of an economic downturn should be allowed to fail in an orderly fashion. But institutions at risk of insolvency due to a market panic should be provided with liquidity. The Bagehot Rule: "lend freely to solvent banks, against good collateral, at a penalty rate" (although see my comment below about solvency). I am simply extending that rule to shadow banks and non-banks. In a market panic it is impossible in practice to distinguish insolvency and illiquidity because of the asset price collapse. We have to stop the run and stabilise asset prices at some level. To do that, we need to provide unlimited liquidity to everything. Once asset prices have stabilised, it should then be possible to identify institutions that really are insolvent and wind them up. That's the bit we shirked, wrongly in my view. But you can't do that when asset prices are in freefall. I also think you massively underestimate the damage to the wider economy that a market panic can cause. Panics are unbelievably destructive. They cannot simply be left to run their course. Ordinary people's livelihoods, their jobs, their savings, their homes are at risk. While I might massively underestimate the damage to the wider economy that a market panic can cause, I firmly belong to the camp that does not believe in intervention by the Fed as the solution, more so when they have caused the problem with their policies and lack of foresight (or may be it is intentional) in anticipating the repercussions of their policies. In fact I would say that the Fed is the cause of the problems. It only shows the paucity of thought at the Fed. They simply do more of the same-- foster a bubble through low interest rate (creates misallocation of capital, reach for yield, increase in margin debt), when the bubble gets too big (and ordinary people are holding the hot potato) raise interest rate (basically prick the bubble), crisis ensues, ordinary people who are late to the party get burnt, ride in like a knight in shining armor, bail out entities who should have failed, reduce interest rate, stop the falling knife by throwing more money, proclaim that you have saved the world, rinse repeat! Generally how can you expect an entity which has created the problem, and has paucity of ideas (repeats the same action since LTCM), does not know that their policies creates bubbles (or does not care-- since they cannot proclaim to have saved the world and claim omnipotence), pricks the bubble at exactly the moment when public is holding the bag) to solve the problem. In my above post, I accept I have digressed from your topic of bank runs (stopping which is the correct response due to its cascading effect) but since the reason for this bank run is the Fed's policy and lack of anticipation (Bernanke's various comments till 2008) I felt I needed to touch upon it. You say that a fall in asset prices threatens the solvency of commercial banks but you don't go as far as to say that it must cause the insolvency of commercial banks. I took that as read. If asset price collapse is not stopped, then commercial banks inevitably become insolvent too. Clearing banks. Not all retail banks are clearers - small retail banks may use larger banks to process payments because access to payments software is expensive. But all banks are vulnerable in an asset price collapse. Your basic point is the big weakness in Vickers’s much vaunted “ring fence” is it not? Vickers’s big idea was to separate investment banks from retail / commercial banks, plus Vickers sort of hinted that investment banks would be allowed to fail. But according to Laurence Kotlikoff, Vickers’s never explicitly said whether they’d actually let a Lehmans fail. I.e. (to be thoroughly beastly to Vickers), his ring fence was the best idea he could come up with, but in his heart of hearts he knew it not much of an idea. "provide central bank support to everything and taxpayer support to nothing. And take steps to ensure that investment banks and commercial banks alike maintain good asset quality and defensive balance sheet structures." No way should my remarks in this post be taken as indicating support for structural separation. Insolvent on an accounting basis, but the bank is not bankrupt. The market value of the assets may be lower but that is not the the same as the borrowers not making interest and capital payments and so funding the bank's liabilaties. Frankly, if collapsing asset prices means that commercial banks can't fund themselves, whether borrowers are still making payments is completely immaterial. Northern Rock was insolvent, but its borrowers were still making payments even on sub-prime loans - and still are to this day. Same with the other insolvent banks. Insolvency doesn't mean that borrowers stop making payments. It means that banks can't meet their obligations as they fall due. But they can make the obligations because of liquidity support. So they are not bankrupt. No. I said there were limits....central bank funding is collateralised. Well there is the problem there. Banks price colateral at a market price that is created by the credit that the colateral itself is colateralising. Therefore when the colateral is actually required it is not going to be enough because at that time the credit that gave it its previouse price is not there. Northern Rock was the only UK retail bank run from the financial crisis, but it was preceded by the retail bank run on countrywide financial in California. It did not appear to be commonly reported in the main US newspapers but was reported by some smaller news outlets like the la times. So back on subject and wholesale runs. While institutional investors in the wider sense can affect wholesale and post Lehman with the almost breaking of the buck this is true, it can also mean other banks. Part of Lehman's problem was that it was arbitraging regulation using repo 105 and other banks involved suspected something. So the part of the problem may well have been that the wholesale and shadow banking system was opaque. That would suggest to me wholesale and repo clearing and reporting might be better than splitting up banks. It is my belief that UK part of the financial crisis stemmed from wholesale funding from the US operating to some extent through Ireland caused UK financial institutions to try to compete for the same funding and using the same business methods. The root cause being that wholesale money in the US was under priced due to insurance by the likes of the monolines and AIG not being worth the paper it was written on in a downturn. Its yet another opaque area where banks don't report hedging clearly or how they net out hedges. As for Collapsing asset values then it depends on whether the asset really does have a sensible value. Propping up asset prices beyond there real world value (sensible rather than fire sale value) means just delaying the pain that has to be taken by somebody at some point and potentially gives price inflation, which wage inflation cannot keep up with. Carefully managed asset prices which I think post panic the Fed has failed to do. Thanks. I wasn't aware that there was a retail run on Countrywide Financial. I would agree about transparency. However, as you say, the other banks suspected something. As they did with Northern Rock, which had seen continually rising funding costs for at least six months before its collapse because of concerns about the stability of its funding model. Markets are prone to panics, but they do get some things right. It's an interesting theory about the Irish dimension to the UK part of the financial crisis. I agree about the business models. Most banks and building societies suffered to a greater or lesser extent because of over-reliance on wholesale funding. However, the proximate cause of the failure of both HBOS and RBS was the bank run after the fall of Lehman. HBOS failed within three days of Lehman. Regarding propping up asset values, collapse of asset values in a liquidity crisis is no more likely to reflect their realistic values than over-inflation of asset values in a boom. A fire sale is no way to establish the true value of an asset. I seem to remember that the likes of GE money operating out of Ireland were taking an increasing share of car loan and both domestic and business small loans. HBOS I seem to remember was heavily into sub prime loans in the UK while RBS was trying to build up its sub prime loan business in the US. It was a wholesale run, but I think the initial run was on the monolines and AIG as securitised assets were downgraded which spread to banks which were heavily exposed to them. MMFs pulled funds on a simply massive scale when Reserve Primary broke the buck after suffering heavy losses in the fall of Lehman - that's Phase 1. The monolines and AIG suffered sharply rising margin calls (Phase 2) on CDS as asset prices collapsed, and as you rightly point out this spread contagion to the banks that held the insured assets, destroying the value of their collateral and making it impossible for them to fund themselves (Phase 3). Does that help? Could you clarify one point for me in relation to what you are saying about the risk to commercial banks from collapsing asset prices. Are you talking about the risks those banks might have from direct long positions taken on those assets, or are you thinking more about the risk of credit losses on exposures to other financial institutions that may themselves have long asset positions? Both. The most immediate risk is mark-to-market losses on assets available for sale and used as collateral for funding, plus increasing haircuts. That's what caused the problems in the Treasury division at HBOS. But there would also be contagion risk. In that case, I'm interested in whether you think it is actually necessary for commercial banks to have significant direct exposure to asset prices. After all, the need to have access to assets for collateral does not require a bank to run a net long position. They could just as easily run a net short position. What they cannot do is avoid counterparty credit risk, although presumably they could reduce their exposure to asset prices by limiting their lending to the financial sector. That's an interesting question, Nick. I would have thought that as the value of collateral matters for funding, a net short position would be just as problematic when asset prices are crashing. There was an Irish dimension, in that people in the UK started running (if that's a word) their cash from UK banks into Irish ones because the Irish guarantee was officially unlimited, unlike the British one which had a number attached. Alistair Darling took the decision to make ours unlimited in the light of this scramble up the side of the Titanic. The "Post Office" bank accounts, aka a reseller brand of Bank of Ireland, sold hugely and the FSA insisted that the Bank of Ireland create a UK bank subsidiary rather than just a branch operation. TBH the most interesting thing was that there was a run, despite the commitment of the Bank of England to lend without limit of quantity etc, the BBA and the Treasury to guarantee most and then all depositors. To me it was the gun that signalled our transition to a low-trust society. First, I love your articles - they always make an arcane subject easier to understand. But I dont get the idea that the CB can support everything while taxpayers support nothing. One result of the CB supporting everything is surely that duff assets are put on their balance sheet, the risks of which are transferred to the national treasury i.e. the taxpayer? I mean direct taxpayer support, such as recapitalisation or government loans. Yes, of course the central bank puts its balance sheet at risk, and ultimately that risk is borne by the taxpayer. "provide central bank support and put taxpayer at risk to all the speculative activities of the investment banks". You can view it like that. But the alternative is disorderly collapse, which puts the entire economy at risk. Central banks can continue to operate even when their balance sheets are highly risky or technically insolvent. They are the only banks that can do so. In that way they are able to protect the wider economy from the effects of massive financial sector dislocation. Better a damaged central bank than a wrecked economy, frankly. When an asset on a central bank balance sheet defaults does the treasury really always make the Central Bank whole or is it more usual that the defaulted assets are just torn up. I know there were some special arangenments for the BoE QE. But what happens in the general case an asset on the central bank balance sheet defaults. On no...your suggesting a CB 'put' on asset prices. In the event of a crisis the Fed will have to create cash(monetized) to buy and retain the value of a collateral asset. All this does is to make the capital(1%) class richer and incentivises the banking world to keep market values of financial assets high though leveraged activities. Note different anonymous from above. I don't know about the Warren-McCain proposal, but it is a fact that the whole point of the original Glass-Steagall bill was to prevent commercial banks from having direct exposure to the financial assets that are at risk of such crashes. Banks were expected to have hold-to-maturity loans and Treasuries -- other investments, especially in financial instruments, were explicitly restricted. Note that your terminology (phase 1, 2, 3) implies sequential order. I don't understand why your "phases" should be put under the same category. There are wholesale runs on bank deposits (Northern Rock), there are wholesale runs on money market funds (post-Lehman), and there are runs on collateralized lending (your phase 2-3, Bear Stearns and Lehman). Although they all implicate liquidity, they occur at different times and for different reasons. Thus, it's far from clear that they should be addressed by the same tools or that they have the same consequences. Your lumping together of all liquidity crises into "bank run" is extremely confusing. Glass-Steagall did not restrict securities investments nearly as much as you suggest. For example, it would not have prevented banks investing in agency MBS. And I did say that ALL asset classes are at risk in a widespread bank run - including safe assets. I specifically said in the post that the "phases" could be concurrent or sequential. It really doesn't matter whether they happen concurrently, sequentially or completely independently: nor does it matter that the actual liquidity tools required may be different. It is the principle of liquidity support that I am trying to establish. No-one else has found my use of the term "bank run" to mean a liquidity crisis confusing. Are you saying that U.S. Treasuries, the safest of safe assets, fell in value during the crisis? Don't forget that the money that is pulled out of the assets that crash in value has to go somewhere. Agency MBS did not exist for almost 40 years after Glass-Steagall was passed, so I'm not sure what it means to say that the banks at the time were permitted to invest in it. In a widespread bank run the demand is for cash, not Treasuries. Treasuries are sold like all other assets. Therefore yes, Treasuries could fall in value too. Remember that this post is about liquidity crises in general, not about 2008 in particular. If they existed at that time, agency MBS would have been permitted under the terms of the original Glass-Steagall act. Very excellent post. One of the things I had always wondered is if the liquidity injections that occurred post Lehman in the forms of swap lines, commercial paper purchases, etc were enough to avert the crisis. A world without TARP would have left us in a better situation, I think. Frances sayeth, “if the institutions being run upon are investment banks or other non-banks, the commercial banks through which they settle transactions will need central bank liquidity support.” I’m puzzled. First, that cannot be true unless deposits by investment banks at commercial banks form a sufficiently large proportion of deposits at commercial banks. And I doubt they ever would, because the last thing a bank aims to do is have loads of cash sitting around: they aim to lend it out or invest it. But even if the latter “sufficiently large” scenario does obtain, the money withdrawn by investment banks from commercial banks A,B,C….will be deposited back in those commercial banks by whoever investment banks make payments to. But that of course is not to deny that in a panic involving several banks, asset prices will fall, which can lead to problems at banks which initially didn’t have problems. And under the daft system we currently have (which I’d abolish) taxpayers then have to come riding to the rescue. Ralph, I explained in my previous post (the one about Glass-Steagall) why commercial banks require liquidity support when there is a run on non-banks. I don't propose to explain it all again here. The link to my Glass-Steagall post is in the very first line of this post and again in the links at the end. So the crucial question (as I intimated just above) is whether those “flows” really are large enough to “destabilise” the commercial banking system. One reason for thinking they aren’t is that the flows will be random. E.g. for every £Xm paid by Barclays customers to Lloyds customers, there is likely to be about £Xm paid the other way. But clearly there won’t be exactly £Xm going the other way. Another point that casts doubt on your idea is that the monthly turnover at commercial banks attributable to the total decline in shadow bank liabilities over the last four years in the US is small compared to the total sums that commercial banks turn over per month anyway. The table on p.8 here (link below) shows the shadow bank liabilities declining at a bit over $1.5tr a year over the last four years or so. Given that US GDP is about $16tr and that total bank turnover will I would guess be several times that $16tr, I don’t see that commercial banks would have had difficulty coping with the flows of money that resulted from the shadow bank decline. But obviously that is a very crude analysis. Answering the question in any sort of definitive way needs far more research – unless someone has done some research I don’t know about. There is a fallacy of composition in your analysis. You cannot assume that flows of funds between commercial banks in a destabilising run are equal. Across the system AS A WHOLE they are equal, but between individual banks the imbalances may be very large. Bank turnover and GDP have absolutely nothing to do with availability of ready money in commercial banks. My understanding from your post is when a bank run occurs the main issue is it drastically reduces the value of the asset (literally instantaneously) with the bank (that is held as collateral), creates margin calls and generally these two factors feed on each other and makes the bank insolvent even if it holds good asset. If my understanding is correct then probably one solution could be to separate the wholesale lending involving the shadow banks and retail lending involving the commercial (deposit taking) banks, each with its own system of funding, clearing banks and payment. Also the shadow bank system cannot take in retail deposits. Absolutely no connection between them. Each type of bank raises its funds separately and can operate only in one space. Then when there is a bank run due to wholesale lending the central bank can simply watch the shadow bank, its lending partner and its payment service provider go up in flames. Let new entities spring from the ashes. The central bank provides all the support if there is a bank run in the retail space. In any case since depositors are also likely tax-payers, tax-payers support should also be ok anyway. Could you please tell me why this would not work? I think the shadow banks like the present arrangement of mixing depositors so that when the system goes up in flames tax-payers can pick up the tab (and they can get the upside). And according to me the Fed is also in this game. Come on I am sure with the intellectual firepower at their disposal it should be pretty easy to come up with a solution provided they want to. Please read my post "Grieving for Glass-Steagall" regarding your suggestion of creating two completely different payments architectures. I discuss the whole subject in more detail there. The link is in the first line of this post and in the links at the end. Wondering if Glass-Stegall could have prevented a diseaster like the MF-Global. I don't need to tell you about the risk of all the REPO and CDS stuff for example. Glass-Steagall cannot prevent the saver from fraud. The just normal case is that a bank suffers from unbacked unsecured lending. If this can be avoided I think there is lots of room left for fractional reserve banking left to work from a systemic perspective. A bank does not have to be listed at a stock exchange. A thoughtful post, (and I haven't had time to read the other comments). Let me just say this: any loan involves credit risk. The idea that there is a bright line between, essentially, liquidity support and capital support is not true. Banks typically start needing liquidity support before anybody knows whether or not they are insolvent. The ECB lost money lending to Lehman; the Fed took extremely risky collateral such that if many of the banks they lent to had collapsed they would have lost money as well. I was heavily involved in the public sector response to the crisis, so the above is simply just true. So while it makes sense in theory to say capital support bad, liquidity support good, in practice it doesn't work like that. In a widespread bank run, a banks assets diminish in market value. But those assets valued at market value, are ample to supply collaterol to the central bank for the liquidity support needed for the bank to have enough funds to fund the deposits that are being withdrawn. Hey you have nice post. Keep it up Guys. Hey you have awesome post. keep it up guys....!!! 1 ] on a historical [ accuracy ] point , is there a connection between bnp Paribas and bear stearns , vis a vis hedge funds ? other sources talk about bear stearns funds , and bnp funds . they got into trouble around the same time . 2 ] there was probably a run on mmf after buck broken . mmf and others probably ran on repo . I think gorten suggests [ temporary ] end of tbtf initiated second run . again your narrative was a bit too narrow . with a tad more effort , you would be more convincing . 3 ] your argument about the spill over effect from inv bank run , to com bank problems >>> something to do with out of balance . com banks could chose to give them credit . or might have to , if they had sold liquidity puts [ off balance sheet vehicles . not sure inv banks ] . where would com banks get the money from . they might have it , or they themselves would have to borrow . would the market welcome such support of inv banks / off balance sheet vehicles ?